Compiled by John McDaris of SERC. Browse the complete set of Visualization Collections. If you have comments or additional resources to add to the page, use our Feedback box to let us know. Gulf of Mexico Oil Slick Images: Frequently Asked Questions (more info) : This page, from NASA's Earth Observatory, provides guidance for interpreting imagery of the BP Deepwater Horizon oil spill, such as understanding the effects of strong sunlight and differentiating oil from other variations on the ocean's surface. Ocean currents likely to carry oil to Atlantic : A detailed computer modeling study indicates that oil from the massive spill in the Gulf of Mexico might soon extend along thousands of miles of the Atlantic coast and open ocean as early as this summer. The modeling results are captured in a series of dramatic animations produced by the National Center for Atmospheric Research (NCAR) and collaborators. Oil Spill Volume Compared to San Francisco Victorian : This YouTube video helps put into perspective how much 5000 barrels of oil is by building up from a single gallon in increments that are easily compared to each other and to the human figure in the image for scale. 5000 barrels was the original working estimate of how much oil was entering the Gulf of Mexico per day from the Deep Water Horizon wreckage. As of May 14, 2010, the estimates had been raised to 60,000 barrels per day. Using the same analogy in the video, this would be six Victorian row homes of volume per day. How big is the Deep Water Horizon Spill One of the Google Maps engineers designed an image of the oil spill in the Gulf of Mexico that you can move over any city to give you an idea of how large an area the spill is covering. It is a very effective way of putting the size of the spill in terms that people can identify with. The oil spill imagery is being updated periodically as the spill continues. The Google Earth plugin is required to view this visualization but a link is provided on the page. US Oil Spill Explained : This video from Al Jazeera English presents a schematic of what happened in the oil rig fire and collapse as well as some of the ideas for containing the flow of oil from the wreckage. Explosion, Leak at Gulf of Mexico Oil Well : This NASA Earth Observatory page presents a photo gallery of images of the Deep Water Horizon rig fire and oil spill. The images were taken from orbit and show the progression of the oil spill over the weeks since the initial explosion. Oil spill growing in the Gulf : This interactive flash animation from USA Today allows users to track the extent of the oil spill along with satellite overlays and the locations of protective booms and other oil rigs and pipelines in the Gulf of Mexico. Mapping Oil From Space: A Tricky Task for NASA : This brief news story from NPR discusses how NASA uses remote sensing to detect the extent of oil slicks on the ocean, using the specific example of the Deep Water Horizon slick. There is a link to the full report from the NASA Earth Observatory site. Map of the Exxon Valdez Oil Spill: This page from the Exxon Valdez Oil Spill Trustee Council shows the extent of the oil spill and includes a PowerPoint presentation of a NOAA Hazmat Trajectory Model of the spill as well. Photos of the Exxon Valdez Oil Spill: This photo gallery from the Exxon Valdez Oil Spill Trustee Council presents pictures taken of the aftermath of the oil spill in Prince William Sound. Exxon Valdez Oil Spill Photos : NOAA's Office of Response and Restoration has a collection of photos from the 1989 oil spill. Summary Points: 10 Years of Intertidal Monitoring After the Exxon Valdez Spill: This page is the first in a series exploring research that NOAA has conducted to discover the long-term effects of the Exxon Valdez spill. The links at the bottom of the page lead on to additional resources. General NOAA Operational Modeling Environment (GNOME) : GNOME is the oil spill trajectory model used by NOAA's Office of Response and Restoration Emergency Response Division (ERD) responders during an oil spill. The program takes user input of information about a spill, along with a Location File containing prepackaged tide and current data for the region of interest (also available via this page), and generates an oil spill "movie" showing the predicted trajectory of the oil. Living Ocean's Society: Oil Spill Model (more info) : This interactive flash model from the Living Ocean Society allows users to the explore hypothetical oil spills in the Hecate Straight off the northwest coast of Canada. The several scenarios include oil rig spills, spills from oil tankers, as well as accidents involving other vessels. Users can see how the seasonal winds and tides affect which areas are affected by a particular spill. What Happens When an Oil Spill Occurs? (more info) : This online investigation from Exploring Earth allows students to explore the effects oil spills have on coastlines as well as how wind and waves help determine what areas of coastline are affected by a spill. Consequences of Modern Energy Use: A Remote Sensing Analysis of the Gulf Oil Spill using ArcGIS Software - Students download satellite imagery and conduct a remote sensing analysis of the Deepwater Horizon oil spill using ArcGIS software. From On the Cutting Edge: Teaching about Energy. Water Quality Assessment: Computer Analysis - Use computer software to generate diagrams that facilitate the examination of ion concentrations in ground-water and the chemical evolution of organic compounds in an oil spill. 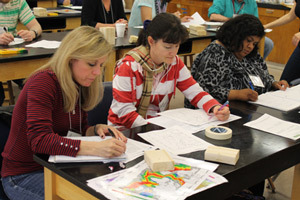 From Teaching Quantitative Skills in the Geoscience. Avoiding Hopeless paralysis - This teaching dilemma deals with how to move students beyond feeling helpless when faced with large and seemingly insurmountable environmental issues. From On the Cutting Edge: The Affective Domain in Teaching. Exploring the Ocean Surface with Data from the Global Drifter Program - This DataSheet describes the data available from the Global Drifter Program and how this information about ocean currents can be used to study various phenomena as diverse as weather and the evolution of oil spills. From Using Data in the Classroom. Exploring the Applications of Synthetic Aperture Radar (SAR) Data - This DataSheet explores the usefulness of SAR data and describes its potential use in the classroom. From Using Data in the Classroom. Oil-Spill Cleanup (more info) -This hands-on experiment from TeachEngineering provides students with an understanding of the issues that surround environmental cleanup. The activity is designed for students in grades 6-8 and allows teachers in different states to see how the activity meets the math and science standards for their state. Hu, C., F. E. Müller-Karger, C. (J.) Taylor, D. Myhre, B. Murch, A. L. Odriozola, and G. Godoy (2003), MODIS Detects Oil Spills in Lake Maracaibo, Venezuela , Eos Trans. AGU, 84(33), doi:10.1029/2003EO330002. Charles H. Peterson, Stanley D. Rice, Jeffrey W. Short, Daniel Esler, James L.Bodkin, Brenda E. Ballachey, and David B. Irons (2003). Long-Term Ecosystem Response to the Exxon Valdez Oil Spill , Science, December 19; 302: 2082-2086. Teaching Oceanography from On the Cutting Edge. Oceanography Visualization Collections from On the Cutting Edge. Red Tide from Microbial Life Resources. The Gulf of Mexico Dead Zone from Microbial Life Resources. Exploring Mote Marine Laboratory Oceanography Data in the Classroom from Using Data in the Classroom.